This article by James Doonan, Postdoctoral Research Officer, School of Natural Sciences is republished from The Conversation under a Creative Commons license. Read the original article. 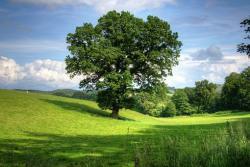 British oak trees are under threat from a disease known as Acute Oak Decline. Mainly affecting mature trees, it can kill them within four to five years of symptoms appearing. However, while researchers like myself have been looking into what causes it, and trying to find a way to prevent it, our work has been hindered in part by the fact that we have to follow a set of scientific rules known as Koch’s postulates. For more than 100 years, scientists have identified which single organism causes a disease according to these postulates. However, more recent research into both plant and animal illnesses has shown that these are too strict, and that we need to start considering how multiple bacteria interact to cause a disease in what is called a “pathobiome”. A pathobiome is essentially a community of interacting bacteria that together cause a disease in animals and plants. Acute Oak Decline, for example, arises from several bacteria which together degrade the trees’ vascular tissues, preventing transport of water and nutrients to the branches and leaves. We have recently identified two bacteria as causative agents of Acute Oak Decline – Brenneria goodwinii and Gibbsiella quercinecans – while others, including Lonsdalea britannica and Rahnella species, have been detected, although their role is currently unclear. Alone, the bacteria which form the pathobiome are harmless, or are less severe. But when alongside other organisms the likelihood, incidence and severity of disease is increased. This gives rise to “emergent property”, meaning that the disease causing property is greater than the sum of the combined organisms. The parasite occurs in every case of the disease in question and under circumstances which can account for the pathological changes and clinical course of the disease. The parasite occurs in no other disease as a fortuitous and non-pathogenic parasite. After being fully isolated from the body and repeatedly grown in pure culture, the parasite can induce the disease anew. The postulates were later adapted to incorporate viruses, and the occurrence of asymptomatic carriers – individuals who are infected but present no symptoms, such as Typhoid Mary. In the 1980s, the postulates were extended again, to acknowledge the discovery that a single gene can be responsible for disease. Pathologists have since exploited this discovery to find that removing a gene from a bacterial cell’s DNA causes it to lose its disease-causing abilities. 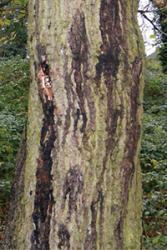 External symptoms of AOD showing position of weeping patches on tree trunks. : © Crown copyright 2014.However, as mentioned above, bacterial diseases in both animals and plants are increasingly being recognised as being caused by a community of bacteria and not a single organism. In Bangladesh, a 2014 study investigated why some people fall dangerously ill with cholera (caused by the bacterium Vibrio cholerae) while others have much reduced symptoms. It was found that the bacterial species Ruminococcus obeum is highly abundant in those who have recovered from the disease – because it was able to outcompete V. cholerae using a communication system known as quorum sensing. V. cholerae mass in the human gut by releasing small diffusible molecules, which “talk” to other bacteria and recruit them to the site in large concentrations. But R. obeum disrupts V. cholerae signalling by releasing its own signal, which prevents V. cholerae from reaching sufficient quantities to release toxins and cause disease. This means that the human gut’s bacterial community can dictate whether an individual falls victim to cholera or remains healthy. Like humans, plants host multiple species of bacteria. They form intricate host-bacterial relationships which can be beneficial, passive or detrimental to plant health. Plants can directly shape their resident bacteria in favour of growth promoting species, by releasing hormones into the soil which encourage colonisation. But unhealthy plants are less able to do this – which leads to a changed community of resident microbes that can contribute to disease. The opportunistic human and plant pathogen Pseudomonas aeruginosa PA14, for example, colonises and persists in host environments which would have previously been protected by the immune system or excluded from the environment by resident bacteria. This makes disease causation difficult to prove under the postulates as the passive bacterium can only cause disease in an already compromised host. Taken together, it becomes clear why we need to start considering the pathobiome as a central factor in disease. Each bacterium can cause different levels of disease according to whether other bacteria are present, and the level of disease can be measured on a scale. Perhaps scientists need a new set of postulates, ones which take into account the accumulated knowledge from the more than 100 years of scientific research since Koch’s original work.